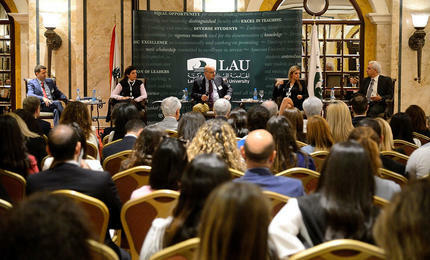 LAU alumni, officials, faculty and staff meet with top HR representatives following a vibrant panel discussion to examine market needs and recruitment trends. The event kicked off with a panel discussion with top HR executives in the fields of advertising, pharmacy, construction and banking. A total of 350 people, including more than 140 alumni and 100 company representatives, attended the LAU Alumni Business Networking Reception held on April 12 at the Phoenicia hotel in Beirut. Taking advantage of the informal setting, Elie Mousallem, who graduated with a B.S. in economics last year, sought out Deloitte & Touche’s representative. “I would like to pursue a master’s degree and eventually move into consulting,” he said. “This networking event is an opportunity for me to discuss the trends in the field, the best master’s programs, know more about HR selection and training needs.” A top student, Moussallem studied at LAU thanks to an LAU scholarship and was hired by BankMed upon graduation through the university’s career services. “I am very thankful to LAU. It has accompanied me all the way, giving me a great education, helping me find a job and, again today, making it possible for me to get professional feedback and ensure I am on the right career path,” he added. Taking the gathering one step further and acting on the suggestion of alumna Rena Temsah, the Alumni Relations Office behind the annual event added a new feature this year with a panel discussion titled “Modern Trends in Recruitment and Selection.” Four speakers from the fields of pharmacy, banking, construction and advertising, moderated by Dean of Students in Beirut Raed Mohsen, shared their experience and practical tips with the audience. Albeit more conservative, the banking industry, too, has added social media to its wide range of technologies though internships and referrals remained crucial, said Dania Kaakani, head of the HR division at BankMed. Lama Mouhayar Hokayem, senior country manager at Amgen for Levant Markets agreed, adding that soft skills, including leadership skills and emotional intelligence were gaining in importance. Moreover, the speakers collectively stressed the need for specialized talents in all fields. Aref Abou Alwan, manager MIS and Business process re-engineering at Consolidated Contractors International Corporation advised those in engineering and others to look into market needs and to specialize accordingly. “In the construction world, we need experts in quality control, in health safety environment and other specialties that we cannot find among our graduates,” he said, adding that continuous development was crucial to those who wanted to evolve in their careers. The consensus was that professional development, ethical behavior, compliance with the company’s culture, motivation and teamwork were fundamental to employee retention. These qualities aside, LAU President Joseph G. Jabbra underscored the value of passion and motivation, coupled with a strong education, sound decision-making and self-confidence―rather than arrogance―in a candidate. “You have to be innovative in your thinking and be ready to continue to learn,” he told the alumni. The success of the informal reception was evident in the business cards that swapped hands and the interviews set for the following day. “I come every year, knowing that I will find talented people and it has never failed,” said Nouhad Tahan, senior manager-HR at Ernst & Young. The Alumni Business Networking Reception is an annual event organized by the Alumni Relations Office in collaboration with the Dean of Students Office.